The program would put Waymo ahead of the curve. We may not have to wait much longer to jump in a taxi without a human driver. According to Bloomberg, Waymo is about to unveil the world’s first driverless ride-hailing service as soon as next month. Waymo has yet to officially announce a new name for the project. According to Bloomberg‘s source, the service will be limited to a handful of authorized cars in a 100 square mile area across a number of Phoenix suburbs. 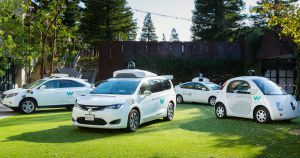 The Alphabet-owned company has been test driving its modified driverless Chrysler Pacifica minivans on the streets of Silicon Valley and Arizona for some time now. Since March of this year, Waymo’s Early Rider Program has allowed test groups — including families — to go for driverless rides around Phoenix. Those Early Riders will be the first to access the new program, according to Bloomberg. It’s very likely Waymo will want to expand the commercial service to different parts of the country, but that might take some time. While its driverless technology is already ahead of the curve, Waymo’s approach is to slowly expand to other areas without incurring major setbacks such as a crash. Waymo is already planning on adding 62,000 hybrid minivans, and 20,000 electric Jaguar I-Pace SUVs to its driverless fleet by 2020. Time will tell whether we’ll see Waymo’s driverless minivans give people rides. But opening a fully fledged driverless service to the masses would be bound to give Waymo unprecedented visibility. The takeaway: It’s starting to look as though it’s no longer a matter of “if,” but “when” Uber and Lyft drivers will be replaced with sophisticated technology.